To create a lawn-care business solely fueled by a domestically produced, clean-burning energy source that would set the company apart from its competition. 53 percent fuel savings per gallon when compared to gasoline. 14,685 pounds of carbon dioxide eliminated from Pristine Green’s carbon footprint each year, based on an estimated 30,000 miles traveled per year. 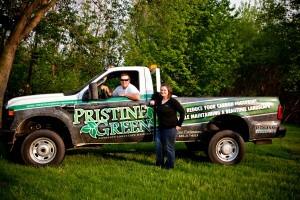 Pristine Green of Grand Rapids, Michigan, is inspiring people to change the way they think about lawn care by choosing clean-burning, domestically produced propane to fuel their business. Owners Jesse and Hilary Triick, who purchased a ROUSH CleanTech Ford F-350 fueled by propane autogas in April 2010, are finding it a reliable foundation for creating a complete lawn-care service geared toward helping people reduce their carbon footprint — while maintaining a beautiful landscape. According to the Triicks, Pristine Green is the only propane-powered complete lawn-care and maintenance solution available in Michigan. This distinct title has garnered the attention of customers and peers looking for eco-friendly solutions to the emissions generated through the lawn-care industry. The ROUSH CleanTech propane autogas powered Ford F-350 features an in-bed fuel tank option that still allows plenty of room for transporting lawn equipment and cargo in the truck’s bed. The truck also boasts a custom wrap to reflect the pride Pristine Green has in choosing American-made exceptional energy for their company’s needs. Jesse says estimates show that up to 10 percent of the pollution in the U.S. is caused by the lawn-care industry. He contributes his switch to propane for cutting his company’s toxic emissions of benzene and toluene by 96 percent. By using propane in both his on-road truck and lawn-care equipment, Jesse offers a double punch of environmental stewardship. Propane autogas burns cleaner than gasoline or diesel, with up to 20 percent less nitrogen oxide, 60 percent less carbon monoxide, up to 24 percent fewer greenhouse gas emissions, and fewer particulate emissions when compared to gasoline. Research by the Propane Education & Research Council proves that propane mowers reduce greenhouse gas emissions by about 50 percent and carbon monoxide by more than 80 percent, when compared to gasoline mowers. The West Michigan Clean Air Coalition monitors Ozone Action Days in Michigan. Warnings are issued when ground-level ozone, fine particulate matter, or both, are expected to reach or exceed the “unhealthy for sensitive groups” threshold on the air-quality index, when ozone levels are above 75 parts per billion over an eight-hour period, or fine particle levels are above 35 micrograms per cubit meter over a 24-hour period. The chemical components of ozone come from a variety of sources, many of which are man-made. “By reducing the amounts of chemicals and emissions our power equipment and vehicle release, we can feel good about our efforts to reduce the formation of ground-level ozone,” said Hilary. Jesse and Hilary dedicated a lot of time toward researching all forms of alternative energy that could be put to work in their industry. They found propane the winner, especially when it came down to performance and cost analysis. “Electric doesn’t provide enough run-time; I can only get about 90 minutes out of an electric mower. And compressed natural gas is entirely cost prohibitive,” said Jesse. Once the decision to switch to propane autogas for their transportation needs was made, the couple purchased their ROUSH CleanTech truck from a locally owned and operated dealership, Fox Ford. With fuel prices reaching $4.19 per gallon in the Triicks’ service area, the switch to propane autogas has trimmed fuel costs in half. According to Jesse and Hilary, they are paying only $2.00 per gallon for propane autogas (as of May 2011), and that is before any government tax incentives. The Triicks installed an on-site 1,000-gallon propane tank with a four-by-four-by-four-foot cabinet and pump and hoses of varying sizes for their different applications. This decision has cut out trips to the gas station and has enabled their crew to carry more fuel. As Jesse and Hilary are quickly discovering, most people don’t think of propane as an alternative fuel when looking to make a change. But, propane is a readily available fuel choice that offers a one-stop solution — not only can it effectively power equipment, but it’s a clean, domestic choice for vehicles. Jesse and Hilary look forward to witnessing the growth of not only their family business, but the ‘greening up’ of an industry known for creating lush, green landscapes. The Triicks plan to do their part by adding more ROUSH CleanTech vehicles and additional crews to their eco-friendly line-up in the near future.